Wow! We made it to Cayden’s birthday, with only a little stress. This normally chaotic and stressful time, was definitely eased by this journey of sharing. I hope I have blessed you with my stories, and helped you to see that ANY life is worth living no matter how short, or how challenged, or how trying. Without Cayden, I would be a different person. Not sure I know quite how, but I am sure my life would have taken a different turn. Like I shared in yesterday’s post, if he had been born ‘normal’ I might be a working mom, running from place to place, trying to juggle the activities and sports of 3 kids, while I did theatre design work on the side. If he had just died in utero, I might have been changed, but differently than I was by getting the blessing of spending 4 ½ years with Cayden. If he had not died, and still was with us, my life would still be changed, but perhaps not as much as I might imagine. It’s hard to tell. So I am continuing to walk along this new path that God has set before me, doing my best to follow his lead. Some days I get off into the brambles, and I pay for it with some spiritual ‘poison ivy’ that I might have avoided if only I had been obedient. I strive to use God’s Positioning System for my life, allowing Him to have the stress of leadership, while I am His compliant servant. It is a challenge for me to be compliant, that’s true, but I’m working on it. So this is our ending place, for now. I need to close the memory banks & photo books, to allow my heart to heal again. It’s been a month of raw emotion, of remembering the pain, the stress and the joy. There is much more to say, but that can wait for another time. I want to close my series with a poem I wrote many years ago, when the wounds were still raw, and the pain was almost too much to bear. I wrote it for Skylar, to try to ease her pain, and to explain to her why it was okay that Cayden was gone. Ideally, this will someday become a children’s book, perhaps with my own illustrations, but until then, I feel that I am healed enough to share it with the small world of readers I have here on my blog. No eyes but my own have seen this until now. Enjoy, and know I appreciate your prayers, your praise is humbly accepted but unnecessary, as I know I am doing His work, by sharing Cayden with you. I answer, “I don’t know, dear, only God knows really why. But it’s Cayden’s life that’s different now, in so many ways. Here on earth, our Cayden, he couldn’t do a lot. He couldn’t hear, he couldn’t walk, and he couldn’t really talk. Waiting for us to push him so he could move from here to there. But now, up there in Heaven, Cayden gets to run and play! His legs work great and he can sing & dance the day away! He needed all his food pureed into a mushy meat. Everything is wonderful and he can chew it too! The sunlight hurt his eyes if he forgot to wear a hat. Now he sees the crystal city and streets of gold — so bright! There is no sun in Heaven, because Jesus is the Light! But now, in Heaven, he is always hearing angels sing. Cayden couldn’t speak well, only said a few small words. He needed a computer to make his thoughts be heard. Singing praise to Jesus Christ the King in total happiness. On Earth, your brother Cayden often had a lot of pain. We did a lot to help him but he often cried in vain. 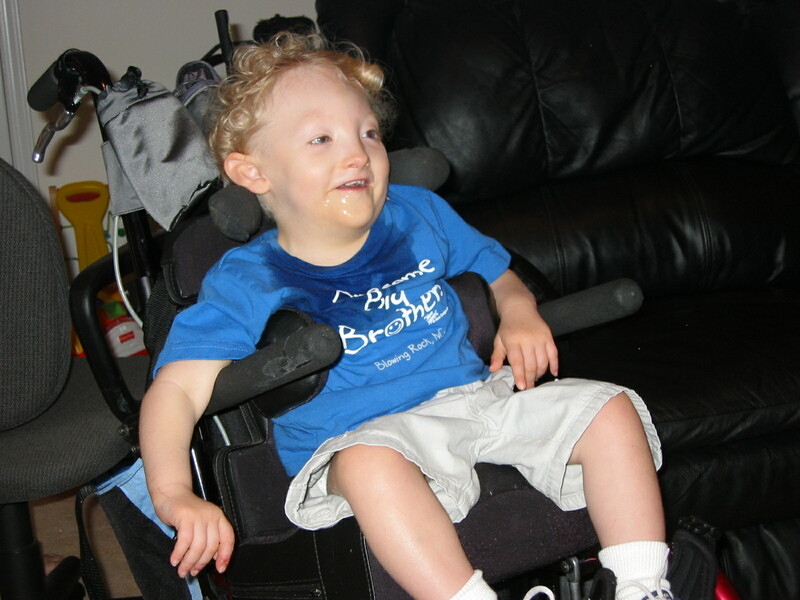 In Heaven, Cayden cries no more and he feels no more pain. He never has to die again, or face any more strain. I know you miss your big brother, we all miss him too. I miss his smile, his giggle and his sloppy kisses –ew! Now Cayden is with Jesus, and his body is brand new! If only we believe in Him and ask Him in our lives. Sorry for the late post, I apologize. I was busy getting ready to start school with the kids tomorrow, trying desperately to complete the re-finishing of Skylar’s new/old desk. This is what happens these days… when I am deep in the recesses of my mind, remembering all the good and bad times that came with Cayden, my two living kids find me & demand my attention. Life goes on, doesn’t it? I was talking with a friend this morning at church and she said how inspiring my posts are, how they make her want to do more for her son who has some special needs of his own. Another mom said how she is a little awed by me and my advocacy and persistence for Cayden. Others have commented on how great a mom I was/am. I feel very humbled by these comments & truly appreciate them, ladies & men (you know who you are). But this praise is not the reason I am sharing my heart and soul. So why am I writing all this? Why am I putting myself to this challenge? I write to raise awareness. 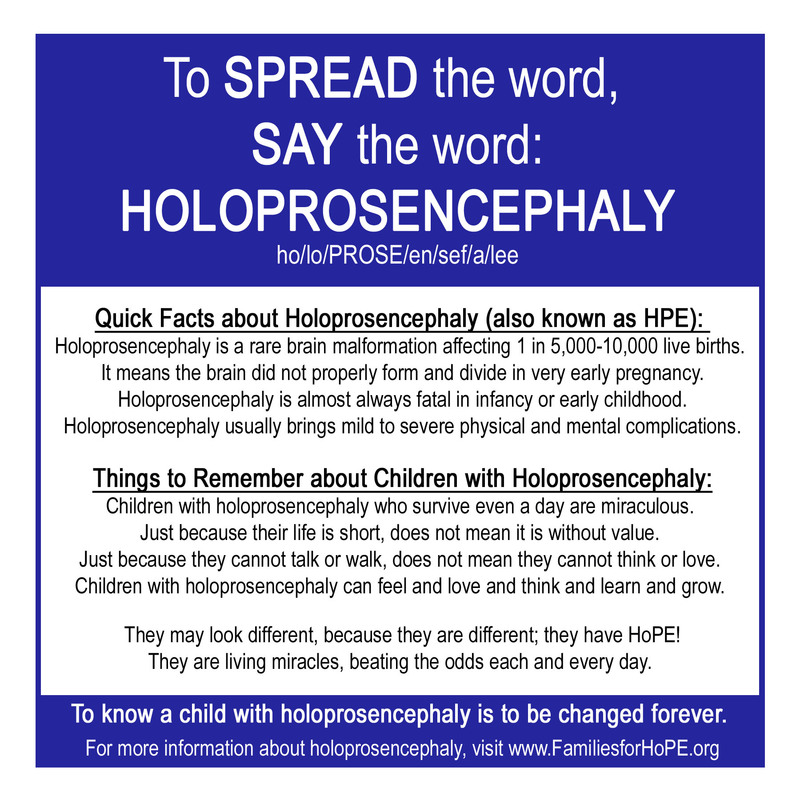 I’m sure many of you reading have not heard of holoprosencephaly before reading these posts. Its a challenging word, with a challenging life, as long or short it may be. 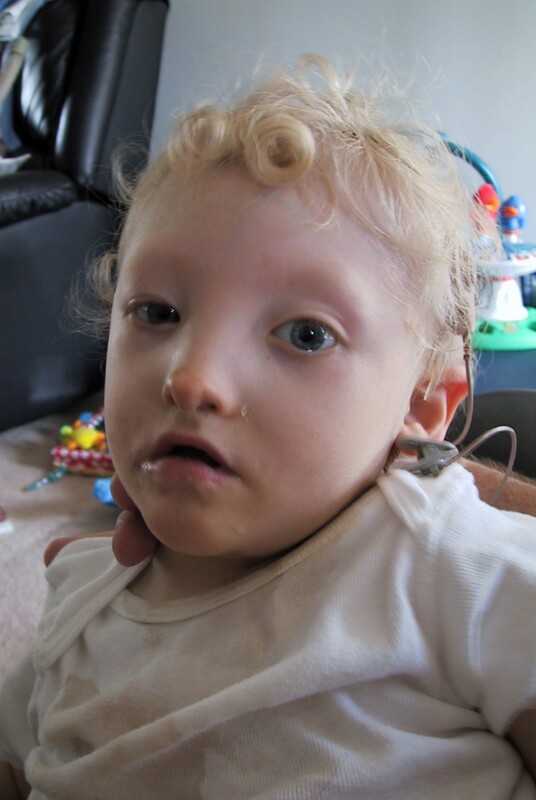 Maybe this little bit of information can bring some curiosity, for you to learn what it all means, how to help, and how not to judge a child who has severe disabilities and possibly facial malformations. Their soul is the same as yours and mine, and worthy of respect and honor. They are not vegetables, they are people! They are not necessary abortions, they are children of God. 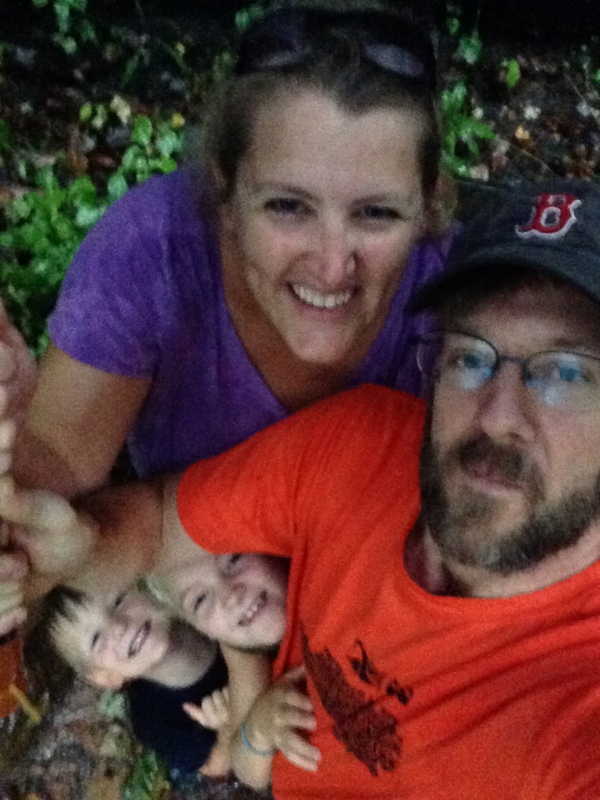 For you, fellow HPE parents, I write to show you the HoPE that can be found in the diagnosis. If your child is still alive, you know all too well the struggles and joys that go along with raising one of these special children. If your child is unborn, or perhaps playing in Heaven with Cayden, maybe I can ease your journey a little as you glean something from Cayden’s story. To see that the doctors are not always correct, and that miracles do still happen. Maybe you see a bit of your child in Cayden, and a bit of me in you. I hope so, and if not, I hope you can see that it doesn’t take a supermom to make things happen, it just takes a vocal, passionate mom to speak up for their child’s needs. I write to share the journey with my friends who know me now, but didn’t know me then. 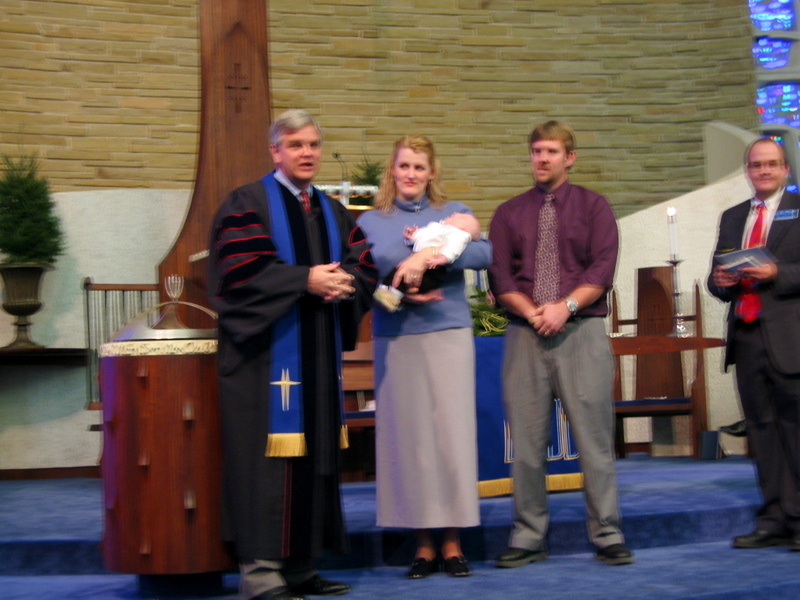 As time passes, and 6+ years have gone by since Cayden went to be with Jesus, friends change. New friends come into our lives, and old friends sometimes fade into the background as the seasons of life go by. Some of my new friends never knew Cayden, never knew that part of my story, they don’t see me as a special needs mom. They may wonder why I empathize so much with the challenges of special needs kids, but I get it. I get it on so many counts, as you now can see. My kid didn’t struggle with reading, instead he struggled with the simplest things in life (like breathing, swallowing and holding up his head!). He had so many issues, I feel that I can empathize with almost any struggle a child may have. (and if Cayden didn’t have it, one of his friends probably did or does!) I know what IEPs are & how hard those meetings can be (his first IEP/transition meeting had at least 13 people at it. 13!) Cayden had a check mark in almost every area that a child can get qualified for in school special services. He didn’t stand a chance, by many accounts, but he persevered and progressed. His progress was in tiny, little, itty-bitty improvements, but it was progress. Inchstones, my fellow HPE moms call them, milestones are much too big steps for these special kids to take. I write to share a big brother with younger siblings. 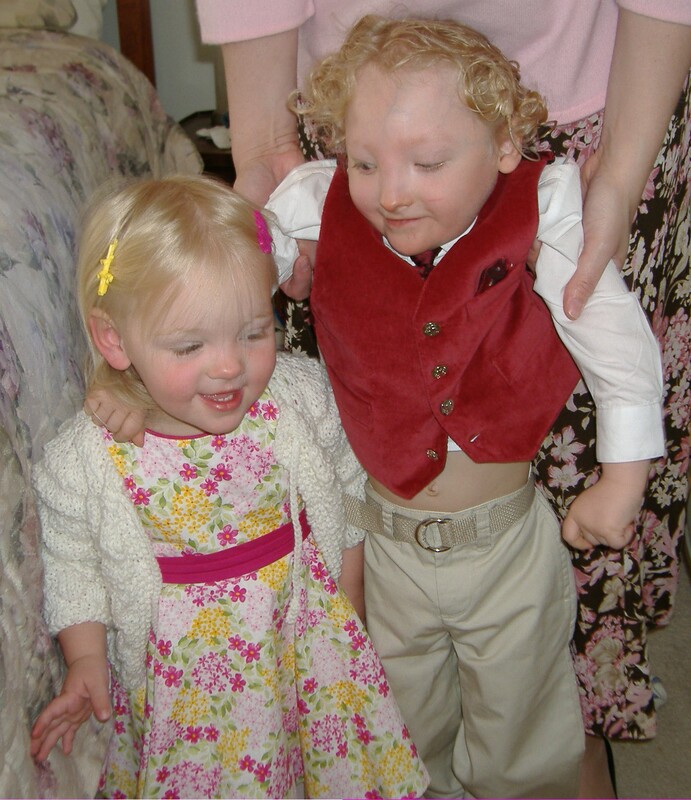 Skylar doesn’t really remember her brother, she was only 2 1/2 when Cayden died. She has inklings of memories, but they are more memories of stories I have told her over and over. Devin was not born when Cayden died, so he needs us to share whatever we can remember so that he has a picture of a big brother in his mind. He used to say how he was mad at Cayden that he died before he could meet him. Devin is such a sweet soul, a family-oriented kid, & it hurts his heart that he could not love on and know this brother that sounds so fun, and had all this cool gear. I miss those gorgeous perfect curls! I write to share my heart and my inspiration. People say to me, then and now, “I don’t know where you come up with these ideas!” I don’t either. It is just who I am. I am a creative minded, out-of-the-box thinker. My training is in Theatre Design. I spent years of my life researching, creating, problem solving and implementing ideas to put onstage, to create interesting and unique sets, lights & costumes. This was not really that much different in my mind. Instead of reading a play & brainstorming an appropriate solution for the scenic or lighting design, I was reading my precious child, seeing what his needs were, and trying to find a workable solution. It’s what I did. It’s what I do. I love researching things, learning things, finding new and creative ideas. This was just a new outlet for my creativity, since I didn’t have time to work with all the appointments, feedings and caregiving. 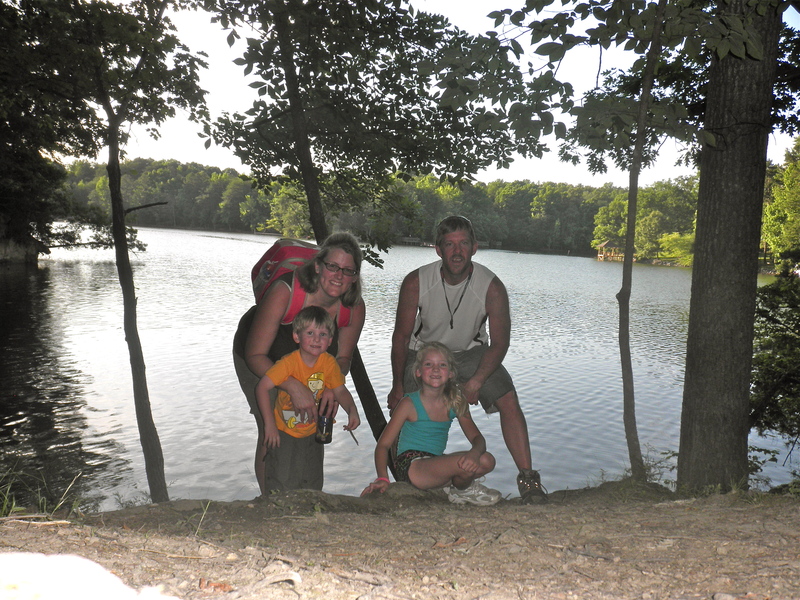 Now, I feed that passion by researching, learning and discovering things to teach my children while we homeschool. It’s just a new way to use the skills I learned in my education, and in my pre-kid career. I write to share my faith. Faith was always a part of my life, but until Cayden’s diagnosis, I didn’t really understand what it meant to RELY on God. To need to know Him, in order to make it through the day, through the pregnancy, through the fear. I needed faith to make it make sense. To make it bearable when we lost him. To know that one day, a reunion will happen as Cayden shows me all around Heaven and it’s streets of gold. And to know that this earthly life is but a mere breath compared to the eternity we will spend together. If I can inspire someone else to see that even though we don’t understand why Cayden and other kids are differently made, we can accept that, love them just the same, and not need to question the whys or wherefores. They just need love, but don’t we all? 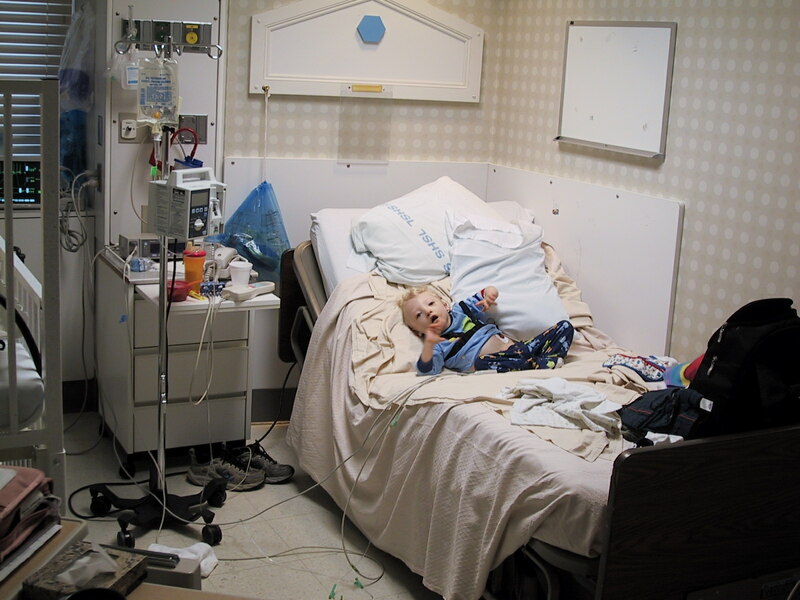 I had never spent time in a hospital until I gave birth to Cayden. By the time he was 4, we were familiar with 5 of the major hospitals in the state, and could even find our way around them without getting lost! If you know hospitals, that says a lot! I write to share the struggles. We had a lot of ups and downs. I can’t begin to write about them all in 28 days. We struggled with a lot of things, and always it was something. Medical equipment, insurance, funding, special services, IEPs, school stuff. Pain, sleep, positioning, comfort. Sleeping. Eating. Breathing. Struggles were commonplace, but through them we always felt Christ sustaining us for the day, through the night, and into the next day. Even the day Cayden died, Christ was there, putting things in place, putting people in place to make the transition as peaceful as possible for us. We still cannot clearly see the purpose in Cayden’s sudden death, cutting short such a promising life, but we have faith that HE knows the plan and will make it work out. Our first family picture at home with Cayden, 10 days old. Romans 8:28 became our family verse while Cayden was a tiny baby. We didn’t understand why Cayden was made the way he was, but GOD works ALL things for OUR good, and WE have been CALLED for HIS purpose. It is not for us to question, we just have to have faith that it is for OUR good, because we love HIM and are called to live for HIS purpose. WOW! Do you see that? God FOREKNEW (Cayden), whom he PREDESTINED to be conformed to the image of CHRIST. and Cayden, the predestined, was CALLED, justified, and GLORIFIED. Cayden is now perfectly healed, justified, and Glorified in heaven where he was Called to be. Maybe it’s not as interesting to you as to me, but I dwell in the fact that God had and HAS a plan for Cayden, for me and for each of us. HE loves us and wants the best for us. And sometimes the best is hard to take, or hard to see amidst the grief and the pain. But it will all be clear in the end. You see, even though we loved this verse from the time Cayden was very small, we didn’t fully SEE this verse until his memorial service. As we were planning his service and writing what we wanted to share, we had the “A-HA!” moment. Romans 8:28 was Cayden’s verse. He was born on 8/28. I write to share the awe I feel at the little discoveries we continue to see in Cayden’s story. 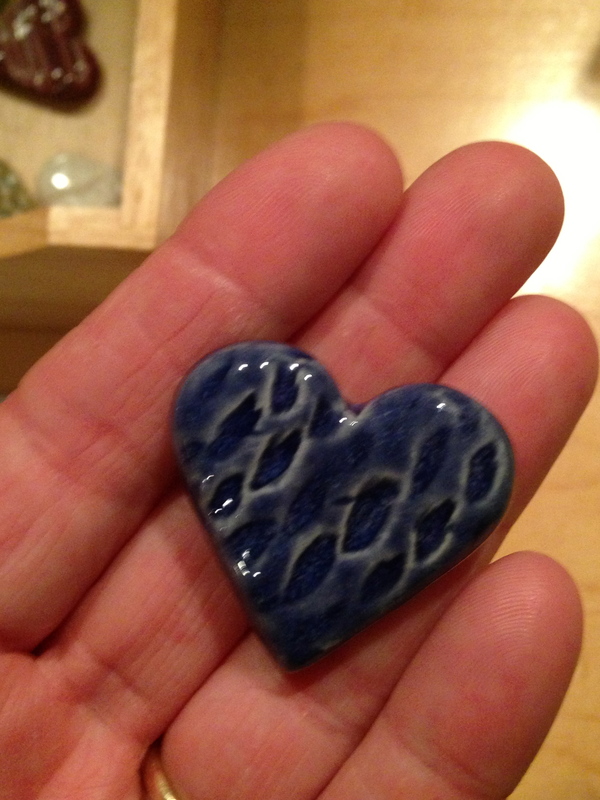 A prayer heart I placed at the chapel at Levine Children’s Hospital last year on Cayden’s Birthday. 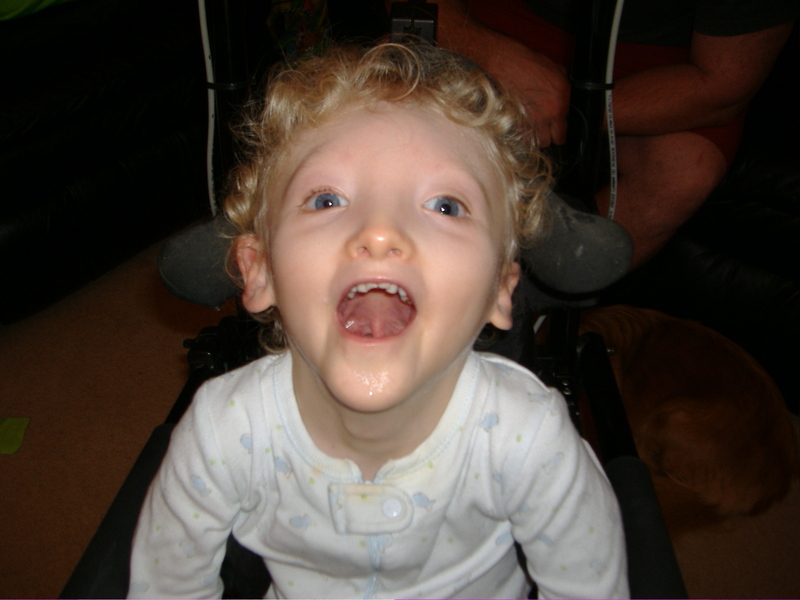 By Shira Arnold  Posted in 28 Days of Cayden, Cayden, Cayden, holoprosencephaly, Hope! This week I’ve shared with you the myriad of devices needed to keep him supported, safe, and seated, but we haven’t talked about walking at all! You may be thinking, another post about research and trials and blah blah blah. This was my life, people. This was what I DID! It was my job, as Cayden’s mom, to figure out how to help him do these things, because just bringing him to the playground didn’t work. I am sick of writing about it after 7 days, think of how tired I was of it after 4 years! I will just go through the progression towards walking and explain how we tried to get C to work through it, some phases had success, others not. All of them were hard for Cayden, and all required some sort of device. Practicing rolling on the ball was a little more fun than the wedge, but still not well liked by Cayden. Cayden HATED rolling. Yes, all caps, all italic. This is greatly emphasized, I probably cannot emphasize it enough, just how much he HATED rolling. And the therapists (God bless the Amy’s, they really were great!) worked non-stop in trying to get him to be able to roll. Down a ramp. On the mat. On a ball. It was miserable. Try doing therapy with a kid who couldn’t hear, probably couldn’t see much. How do you explain to him what you want and let him know he won’t fall? We used fans and vibrating toys to try to encourage him to do what we wanted, but it was so hard! Rolling for Grampy with tickles at the end, made the ball work a bit more bearable. 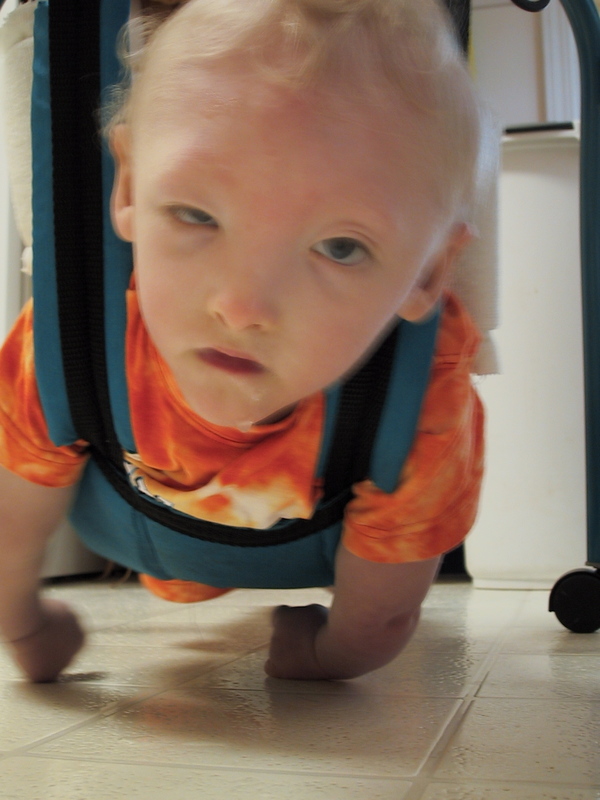 Did you know there is a special device made just to help kids learn to crawl? Several varieties actually. We found one at the equipment lending library called the Creepster Crawler. This was a cool thing, that suspended Cayden above the floor while allowing him to use his arms & legs to move, in the manner of crawling. It helped to build arm strength, head control & the basic back and forth rhythm of crawling. 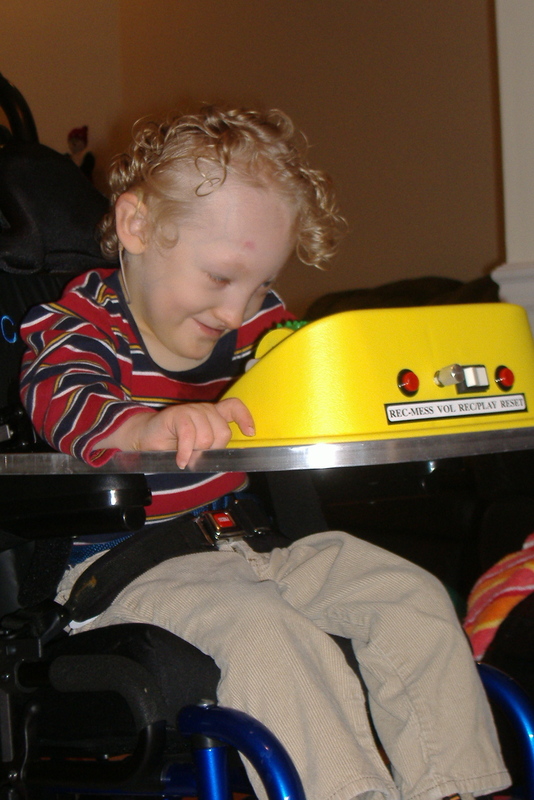 His elbow malformations made this a bit difficult & it was HARD for him to do, but he worked hard in it and seemed to enjoy the feeling of ‘flying.’ This piece of equipment was given to us by an aquantaince, but it was a little too big for Cayden. We made it work, but it certainly was WORK! The pony loaner was a good option, but a little big, so hard for him to move. 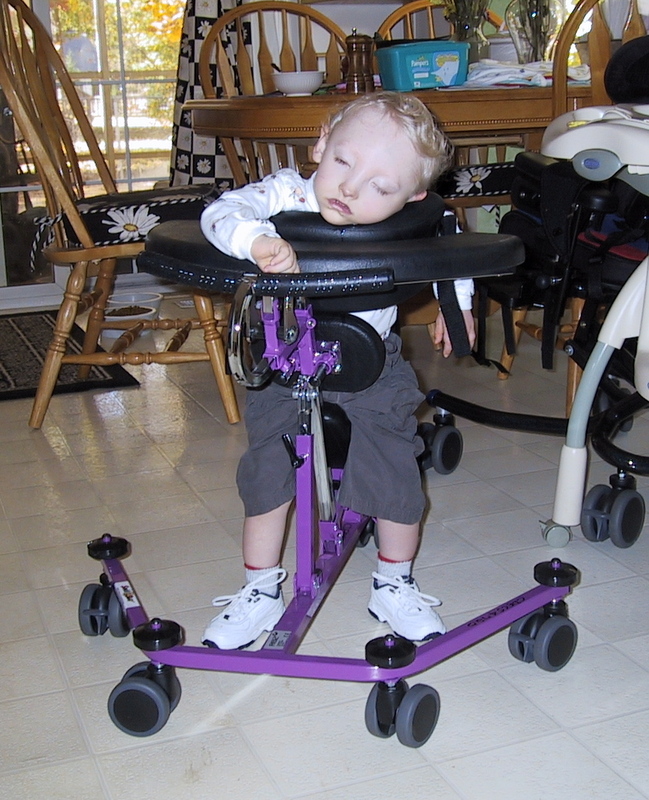 The gait trainer is the special needs kid version of toddling. It is a semi-supported walking device that allows them to partial bear weight & stand without having to support their full body weight. Again, blessed by the equipment lending library, were able to demo a pony gait trainer. This worked quite well for Cayden, and he enjoyed spending time in it. It was another way for him to be vertical, and to stand at his height rather than sit. He never complained about spending time in it, but he never really got moving in it either. It became sort of a resting spot for him, rather than a piece of exercise equipment. Because of that, we decided to go a different route on his personal walker. Cayden enjoyed being in the pony. It was so comfy, sometimes he would have a catnap in it! So many choices of kid’s walkers, but none really seemed to be great. 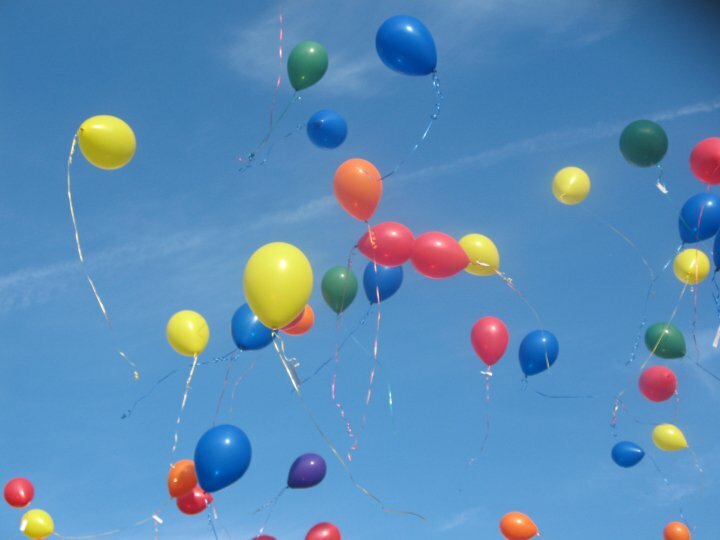 Anything that is fully supportive was so big and bulky and our house was getting full! The kid walk was interesting, it supported him in a similar fashion to the stander, but it was hard to get him into it, being as floppy as he was. He had a hard time moving it anywhere also, and then its legs often got in the way. We ended up with the rifton walker/gait trainer. It was adjustable for height as well as for capability. 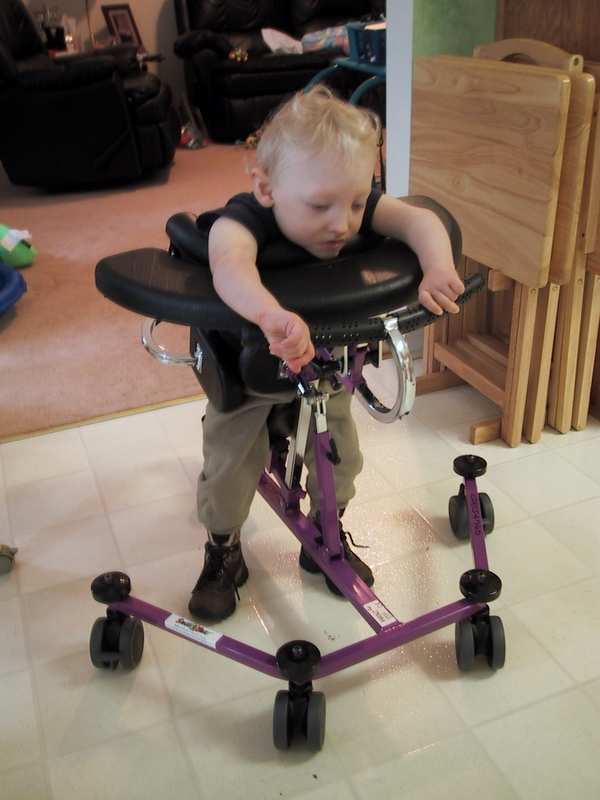 A supportive seat helped him bear weight in his floppy legs, he could rise & push, then sit and rest. It also had a tray for his ECO-13, arm rests, & it was sturdy. The ‘Go Blue!’ Rifton Pacer fully loaded & with the supportive seat. This was Cayden’s ‘Go Blue!’ He was so excited about getting this, after we did a trial at therapy, he was ready to go & walk! As you know by now, the approval and processing time was about 6 months, so he was talking about it for a long time before we got it. The day of delivery finally arrived. The vendor came to the house to deliver it, and fit it to Cayden. It was an afternoon delivery, I think we were his last client of the day. One big problem, he forgot the supportive seat at the warehouse, which was about an hour away. So he told me “Sorry, I will have to bring it back by at a later date.” HMPH. I was supposed to tell Cayden that he had to just look at this long-awaited walker and not be able to use it for another week? Sorry, but no. I became a Momma Bear and told him, ‘No, it was a mistake, but your mistake. I am not going to allow you to punish my son, you will fix it and make it better. You will bring it back tonight. Sorry, but you are working late.’ Pretty sure he didn’t like me much after that! But he did go get it and fit it that night. 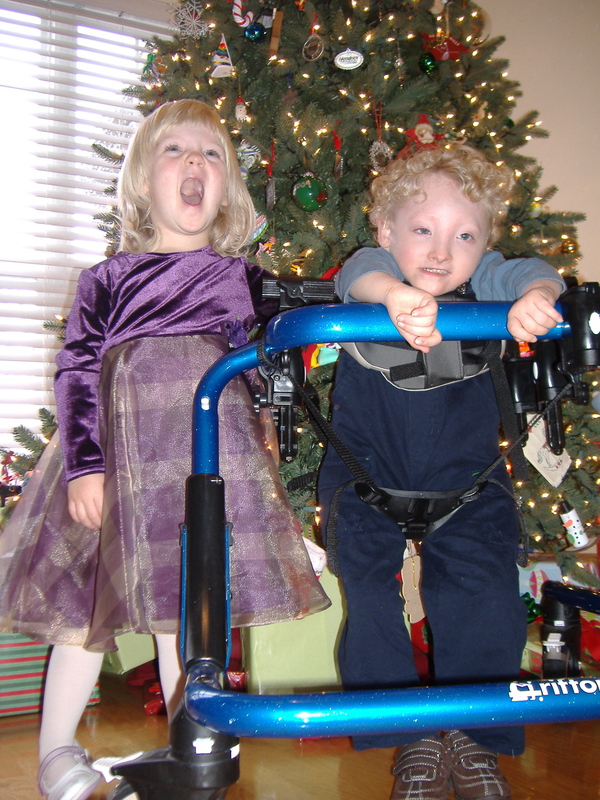 ‘Standing’ with his little sister on Christmas day. For the uninitiated, dealing with equipment vendors is a very large pain in the rear. They are overbooked, probably underpaid, they always seem to put off delivering much-needed equipment, & usually forget things or tools to properly adjust the gear. They insist that they are the only ones capable of properly adjusting the devices, so you always have to wait for an appointment to get things fixed. Joey & I quickly learned how to adjust the pieces ourselves, so we didn’t have to wait on them, but they usually didn’t like us very much for it. However, we had a young child, who was obviously going to need DME for his lifetime, and they didn’t want to lose us as clients, because we could make them a lot of money over the years. 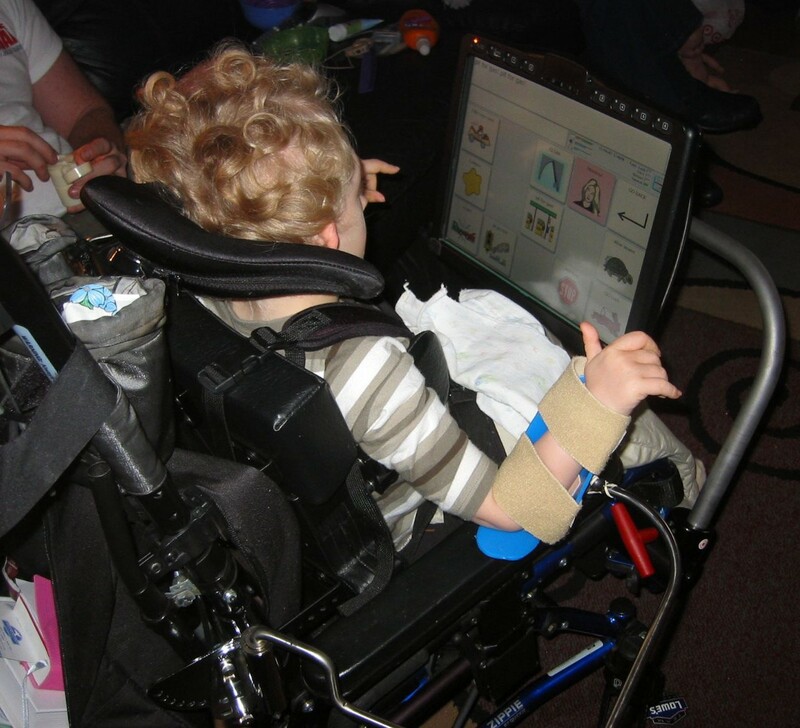 I also learned, from the fiasco with the bath chair, that they get better commissions on certain devices and brands, & will push those items whether they are a good choice for your child or not. Advocacy and learning to speak up loudly for your child, is the only way to make this process a success. The Go Blue walker was a great piece for Cayden. He enjoyed being in it, but it was really hard work. We would bribe him with pudding, oreos, tickles, toys. Each step he’d get a small bite of chocolate pudding, or oreos. We would promise the best movie if he’d make it around the kitchen. Hard hard work. He needed help in lifting and moving his legs forward, but if positioned properly, he would push with the best of efforts. Tiny steps, tiny progress. One day Peter and John were going up to the temple at the time of prayer—at three in the afternoon. Now a man who was lame from birth was being carried to the temple gate called Beautiful, where he was put every day to beg from those going into the temple courts. When he saw Peter and John about to enter, he asked them for money. Peter looked straight at him, as did John. Then Peter said, “Look at us!” So the man gave them his attention, expecting to get something from them. Now is the time when I say just how great his progress was & “Praise God! Cayden jumped to his feet and began to walk!” Right? That is the history of Cayden’s vision and hearing and talking miracles. It was not the case with walking. He never had the opportunity to walk here on this earthly ground unsupported, unattached. The truth of the matter is that I don’t think that he would have been able to walk unsupported, ever. His tone was just too floppy, his legs too weak. 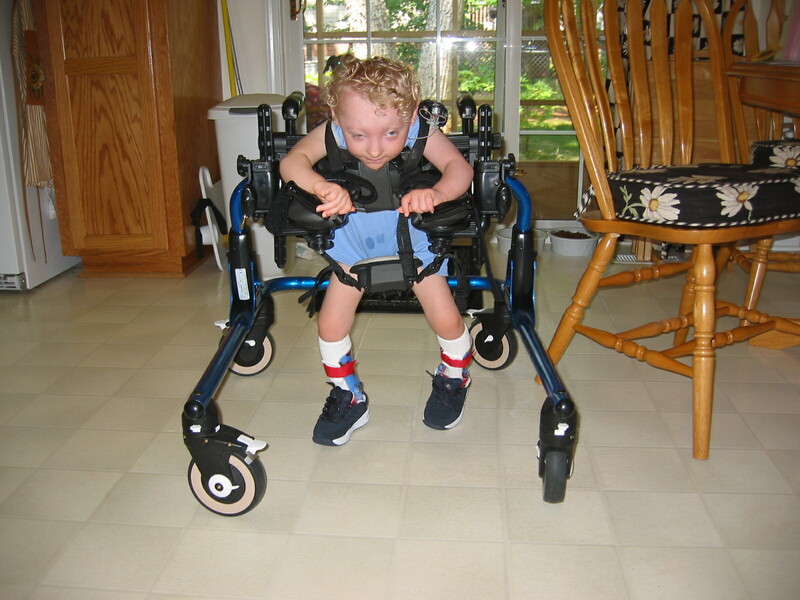 I think he was progressing toward getting somewhat mobile, but truthfully I think as he made strides in the power chair, he would have just wanted to spend the time working on the speed of the chair, rather than the more turtle-like pace of the walker. And who could blame him? But here is the great miracle. The last night Cayden spent on earth, his grandparents were babysitting. The bedtime story they read to the kids was from Cayden’s Read with Me Bible & THIS was the story. One day Jesus was teaching. Some men came carrying a man who could not walk. But they could not get him close to Jesus because of the crowd. They made a hole in the roof above Jesus. Then they lowered the man through it on a mat. They lowered him into the middle of the crowd, right in front of Jesus. My parents said that Cayden was so thrilled by this story. He was giggling and cooing and jabbering after it. In my heart, I firmly believe that Cayden understood this story, and understood that healing was possible through faith. I think his prayer that night was to be healed, to be made whole, so when Jesus called his name that night, Cayden KNEW in his heart that if he went, he would be able to stand up, go to his heavenly home and praise God. Our son is healed. He is whole. He is dancing in fields of grace. As 2 year old Skylar said, He sits in the lap of Jesus, singing ‘Jesus Loves Me.’ Cayden is now made perfect in Christ, hearing, seeing, singing, dancing, running. His chains are gone. He’s been set free. The healed paraplegic from the Children’s Bible, praising God! Cayden needed full support to sit. & that meant everywhere. Can you think of places I haven’t mentioned yet that sitting might be a challenge? For those not in the realm of Special needs kids, there are special things for EVERYTHING! the ones you don’t even think about are often the hardest. Bathtime, toilet time, bedtime. Yes, we had a special devices for bathing. 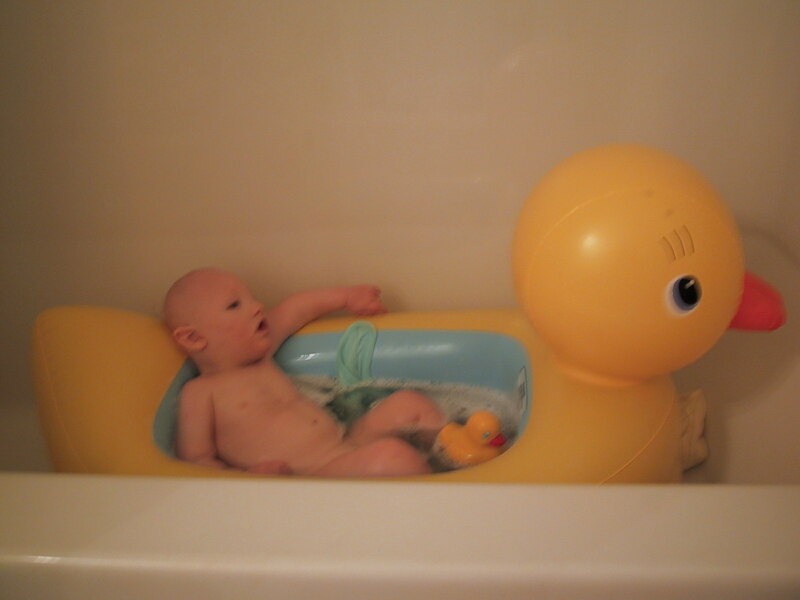 I had a super find of a blow-up baby bath tub that fit right into the big tub. It was soft, had a high back & actually worked very well for our floppy kid. Until his legs got too long. Once he outgrew that, it became something else to research and learn, and unfortunately I picked (or was steered) wrong on this one. 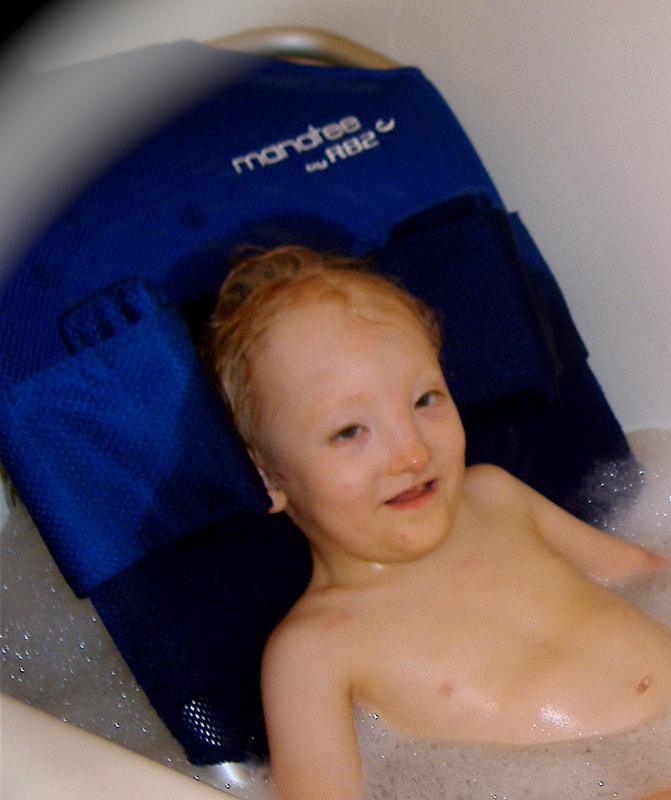 We got the Manatee bath chair, which was a fully adjustable fully supportive bathing seat. 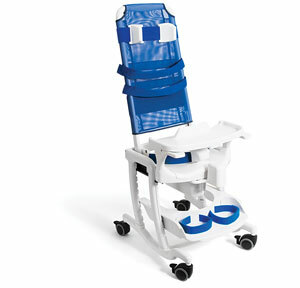 It had straps, lateral supports, a tilt-able back & leg supports, and adjustable height legs. The main problems with this chair was that you had to fill the tub super high in order to cover his body when he was in the chair. And you still had to kneel or get down to bathe him. And it took almost the whole length of the tub. This wasn’t a big problem, but he was 3 and his sister was 1 and we usually tried to bathe them together so they could play. She didn’t have a lot of room. C in his bath chair. He really enjoyed playing in the water or swimming. This chair also had other major issues… when it got wet it was very difficult to adjust. Yes, you read that correctly. A bath chair, didn’t work properly when wet. I actually had to bring this chair to the distributor to have them try to adjust it for us, and they had a hard time, acknowledging that it was a poor design. But did that matter? NO! because just like a wheelchair, the timeline you have to get a new piece of DME of the same category is 3-5 years. So we were stuck with a poorly designed, hardly adjustable, but supposed to be adjustable bath chair for 3 years. And the material it was made of, had a tendency to get smelly if left to dry. HMMM… it gets wet almost daily. It smelled a lot. I washed the fabric, but it was so hard to put on and off, it didn’t happen very often. Just a rookie mistake on this one folks! 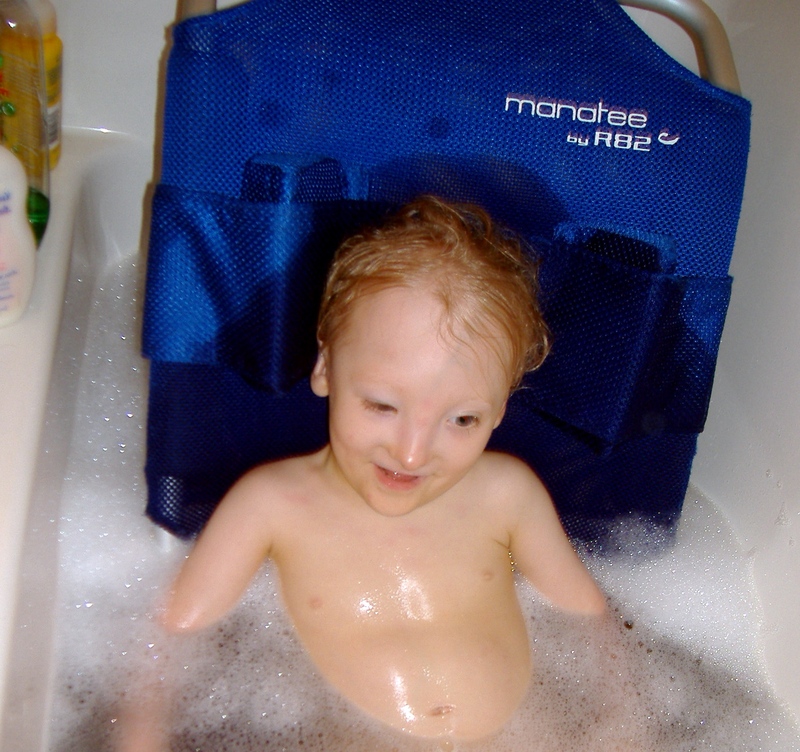 If you are in the market for a bath chair, I truly don’t recommend the Manatee! There are other better chairs out there, and we were looking. Some suggestions: Go for low profile if you want your child to stay warm. Plastic ‘fabric’ that will not hold moisture or smells. Easy to adjust, even when wet. No leg supports if you want another child in the tub at the same time. Shower chairs are smaller, but they don’t allow the child to stay warm, and Cayden really didn’t like the shower sensation on his body, so it was out for us. The kids are higher, so easier to wash, but seems a little unsafe in the end. Personal preference, of course, but just don’t let yourself be taken by that lovely blue (expensive) fabric chair! I don’t have a picture of C in the potty chair (some things I guess you just don’t take photos of!) but this is the one we had. We also had a specialized toilet chair. This one took me months of looking, and months of proving that indeed, Cayden was capable of learning to toilet on his own, in order to get it approved through funding and insurance. We discovered a Rifton potty chair. I liked this device. It had a variety of options for use including: clip onto the toilet, on it’s own with a catch bucket, as a full unit rolled over the toilet, or just as a step. We had the fully loaded model, of course, tilting high back, straps, seat belt, laterals, armrests, foot rest, tray. Yes, they even make an activity tray for the toilet seat. 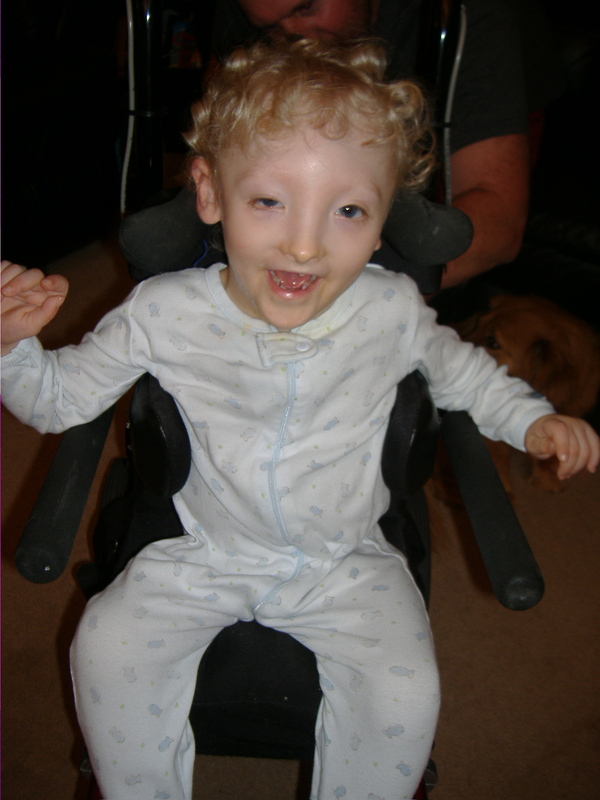 & we had it because of C’s need to push with his arms gave him stability in sitting (& doing those toilet duties). The seat could also sit over the toilet to use, and the small part of the chair with back could just clip on by itself with out the stand. Cayden was actually making progress in this area. 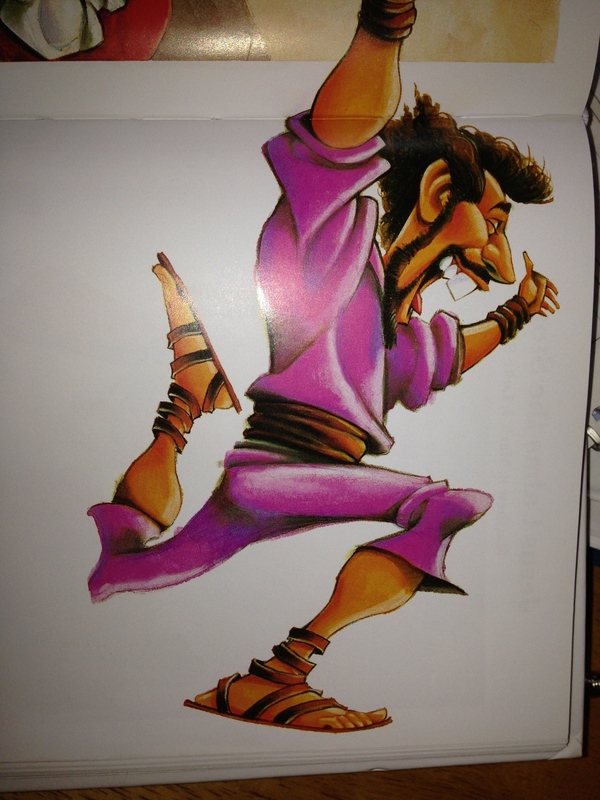 It was a challenge, yes, because of his constipation and digestive issues. Often he had a hard time getting the job done. But he was starting to indicate when he was ready to try & was making good steps towards being trained. That was a big deal! He hated being diapered & really wanted to be independent in that area. The work on transferring was paying off, and we were beginning to see positive outcomes! The thing most people don’t think about is this: these were excellent devices for using at home. But what happens when you travel? or go to the hospital? How do you give your child a bath, or help them use the toilet? Do you take all this stuff with you? As much as things are foldable or portable, there is still too much to take on a trip. Along with the necessities like the wheelchair, the bed positioning pillow, the nebulizer, diapers, wipes, meds, etc. Packing was a pain! So you just usually tried not to go places because inevitably you would forget something important, the kid would get sick, and end up needing to go to a doctor. Sigh. Just not worth the effort. We didn’t often get away for fun with Cayden, we did enough driving to doctors, therapists & hospitals that fun was a weekend staying home. I drove all the time and packed for the day usually, for at least Cayden, and then Skylar too. We would sometimes stay with friends on our trips to Raleigh, which called for an overnight, but a pack & play and a stroller worked okay back then. The older Cayden got and the more gear he had, the less we seemed to get out. But really, staying home, then and now, is a blessing. We spend so much time, running from thing to thing that it is difficult to just be calm and sit. Our society is so go-go-go that a day of rest is really hard to come by. Jesus gives us the answer in Matthew 11:28-30, as he is talking to the public. We can learn much from his words, as we realize that true rest only comes when we walk with Christ, rest in Him, and live in His company daily. He teaches us what is important and what should be released. What we need to stress about, and what we need to let Him conquer. So much of Cayden’s life was out of our control, so we learned that we needed to rest in Him, for Cayden, and trust that His plan was great, and it would be for good. 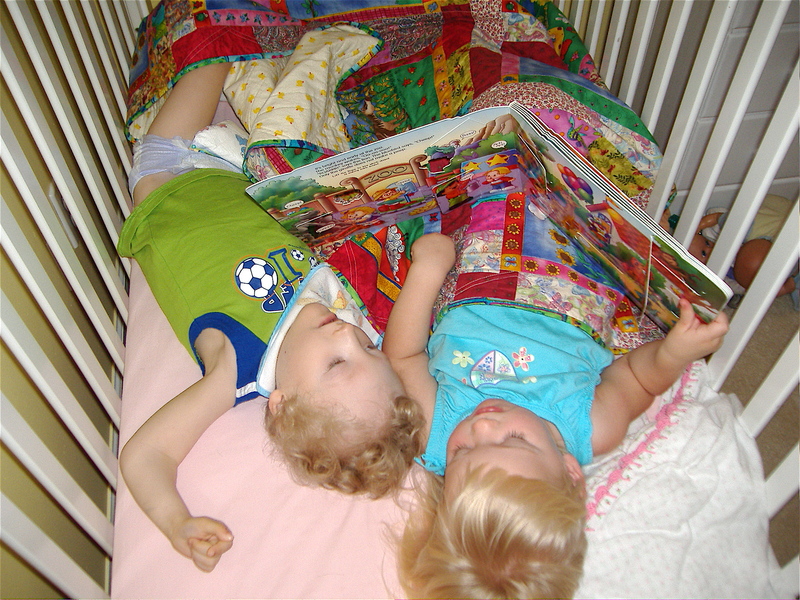 We learned that little things are what matter, the cuddling, the reading, the playing together. And we learned to lay our cares on Him. I hope you too can find the real rest that Jesus brings, because we know that while the kids are young, sleep is hard to come by. More about sleep (or our lack thereof) tomorrow. Getting a wheelchair is somewhat of a major step to take. It is saying to the public, “Yes, my child is handicapped. 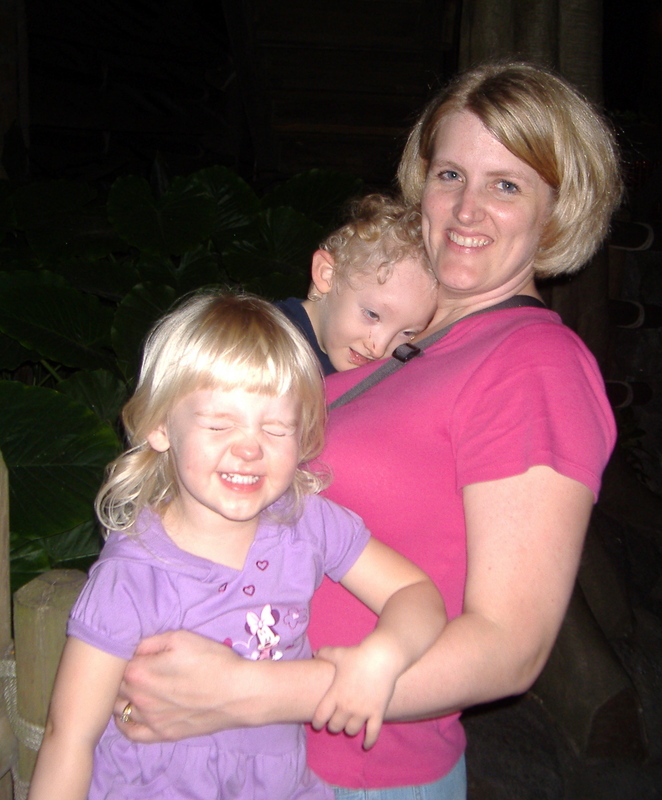 Yes, my child is different.” It also feels like you might be saying, “I am giving up on the hope that my child will walk.” It is a hard hard step to take, and a hard hard choice to make. We had hopes that Cayden would be able to walk. His leg strength seemed to be there, but his body was so floppy the hopes began to fade away the older he got. And the sitting challenges became harder the taller he grew, so it became necessary to take that final difficult step. Yes, we needed a wheelchair. This was the night we got his first wheelchair. I thought we did a pretty good job sizing it from e-bay!. Because we had originally gotten the activity chair when Cayden was 2, we were ‘supposed’ to wait until he was around 5 for the wheelchair. (Insurance usually won’t buy a second seating device within 3 years). But by age 3, we saw that it was not going to be possible to wait that long. The double stroller wasn’t working anymore because his legs were just too long. The sit & stand wasn’t a good option for him because he didn’t fit. I needed something that he was secure in and was tall enough for his long legs. I have said before that surfing the special needs websites like vendor sites and, http://www.adaptivemall.com became a bit of a habit for me. I would just spend time looking around, familiarizing myself with the different devices and equipment, and think about ways to try to make it myself or to make it work for us. If I found things I liked, I was known to spend some quality time on ebay, looking for a used version or similar product, saving searches & trying to find a bargain. That is where Cayden’s first wheelchair came from. I admit, this is an unconventional way to get a child’s wheelchair, but we were feeling desperate. A good deal came up, it seemed to be a good size, and it was under $100. We grabbed it up. Giddy guy! Squealing with delight. 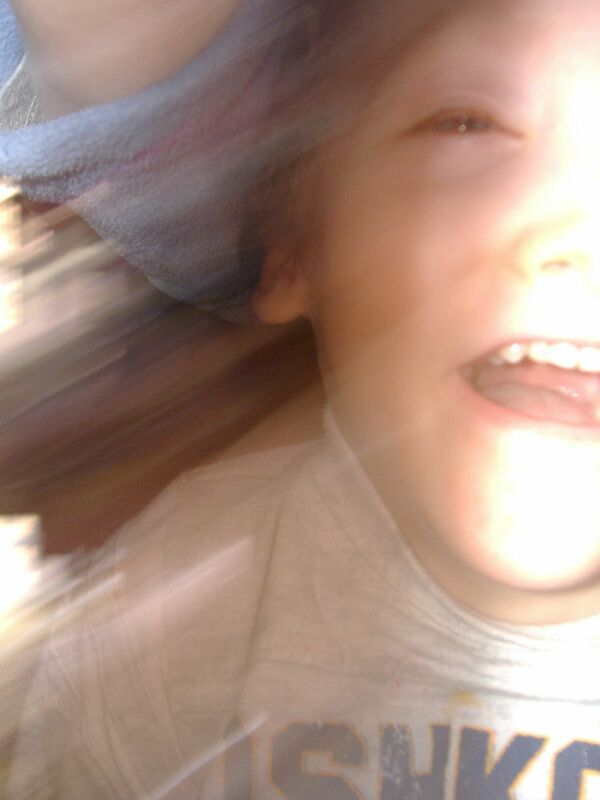 The day the wheelchair came was so exciting. Cayden couldn’t wait for us to put it together & try to figure out how to make it fit him. Joey is very mechanically inclined so we didn’t really have a problem setting it up. And thankfully, it fit Cayden perfectly. You can see from the pictures, he was so excited! He was just laughing and giggling. All over a used wheelchair. 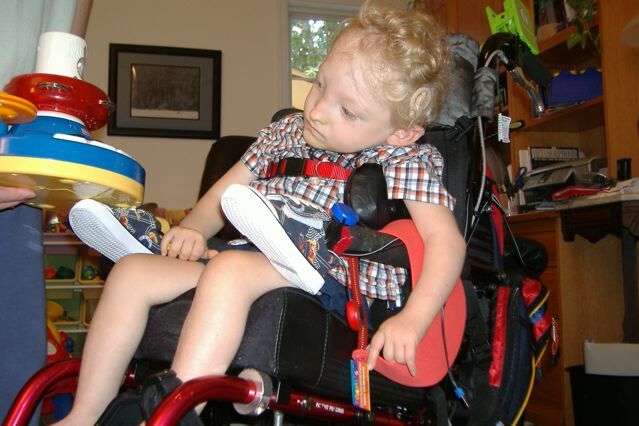 His giddy response made us realize that the issue we had as adults with the wheelchair and what it symbolized to the world was not an issue for Cayden. He didn’t care what it meant or what it said to the world. He felt secure. He felt safe. He was comfortable and sitting properly for the first time in a long while. People often make quick judgements based on appearance, or what things seem to be. Not just adults, but kids easily do it as well. We could see how people looked at Cayden and would feel pity, or sorrow or maybe disgust, but what Cayden always gave back was joy, peace and love. He was an open book, a mostly happy, smart, interactive kid, who was a joy to be around. A simple clip on umbrella made a great sunshade for photophobic Cayden, during a day at the lake. I never minded when strangers or friends would ask me “What’s wrong with him?” or “Why is he in a wheelchair?” at least they were brave enough to ask and learn a little about him. What drove me nuts was when people would just look & stare and wonder, but not ask, and not say hi to him. Just obviously look & talk about him, three tables over. I urge you to remember (and to teach your children) that many kids in wheelchairs can think and talk just like you and I. They can say hi and respond back in their way, and to greet them with a smile and a “How are you?” will make their day (rather than stare, a point and a whisper). They thrive on interaction and want to be acknowledged as much as you would. Don’t judge a book by it’s cover is the common phrase we use today. Judging others without knowledge can cause undeniable pain. It brings misunderstanding, pain and possibly ruined relationships. Jesus warned us to not judge, or jump to conclusions, because it will most likely come back to haunt us later. It’s so hard to make the choice to put your child in a wheelchair, not only because it can feel like there is a lack of hope, but because you don’t want your child to face the inevitable judgement our society so freely hands out. I still feel judged sometimes. I feel like people look at our ‘perfect’ one boy, one girl family and think “Oh, how nice. 2 cute kids, a mini van, and a yellow lab. What a perfect family.” But what they don’t see from the outside is the hole in my heart from missing and grieving my first born child. They don’t see how some days I think what our family would be like if Cayden had been typical. We’d be doing soccer and scouts with him, he’d be going into 6th grade, and I’d have my 3 stairstep blond kids all around me. Or even better, if he were just him, broken and beautiful and driving all over in his fabulous power chair, talking like crazy to his siblings on his ECO-13. Instead, I have a partially broken heart, a few hundred pictures, and slowly fading memories of a boy born with a malformed brain, a fighting spirit, and a disabled body that needed a whole lot of equipment just to be safe. Everyone has a hidden burden. Don’t judge. Some burdens are more obvious than others. But the burden of missing a handicapped child is far worse than the blessing it is to love and to raise them. 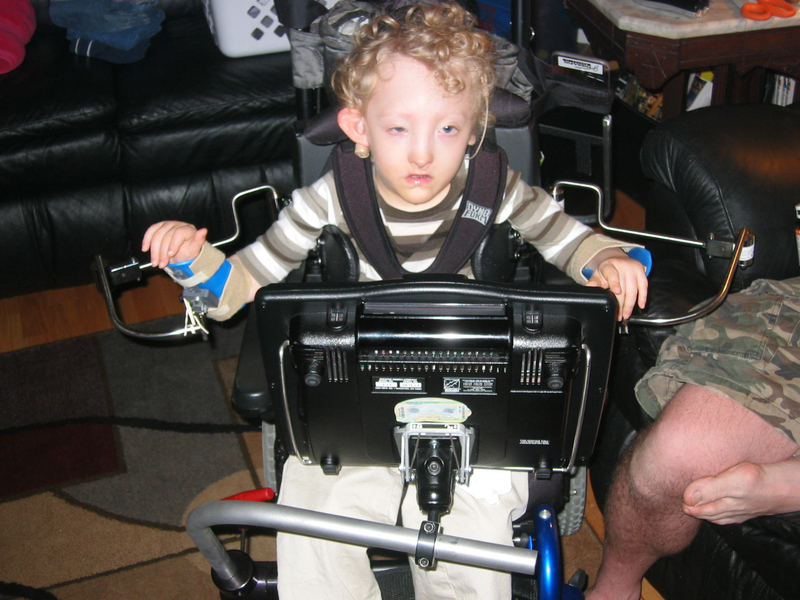 Cayden used the SuperTalker for a while & had good success with that and the eye gaze system. However, I was frustrated with the time-consuming page-changing of that device, and so was Cayden. I finally persuaded the speech team to allow C to have an assessment for a computerized speech generating device (SGD). The speech team was quite sceptical that he really understood what it was for & could really use it, so it took me a while to get the appointment. After a long wait, we finally were scheduled. Cayden was quite excited about it, but if I remember correctly, he was not feeling his best & was having a rough day. We went anyway, since we had waited so long to be seen. He started with the easy switches. They needed to see if he understood the cause & effect of the toys. He did, but, it was obvious that they didn’t believe me, his mom. Of course he thought the toys they had were babyish, so he wasn’t interested & didn’t really want to play with them. Combined with the fact that he was not feeling well, it was just not worth his effort to participate. The team took this disinterest as not understanding, but I persuaded them to try something else. The Springboard Plus. Cayden’s first attempt at ‘talking’ was on this, but with larger icons, I think about 8 on the screen. I could tell that he really liked this device. I know he understood that it was something that would make his life easier & with it he would really be able to speak his mind. The evaluation team was not so sure. We tried several other devices and toys with him, none of which drew his attention as well as the Springboard. After a long evaluation, it was concluded that Cayden probably could benefit from a SGD, now the question was… Which one? The variety was almost overwhelming. But we luckily had a good assistive technology lending library (link) so we were able to do demos on a variety of models. 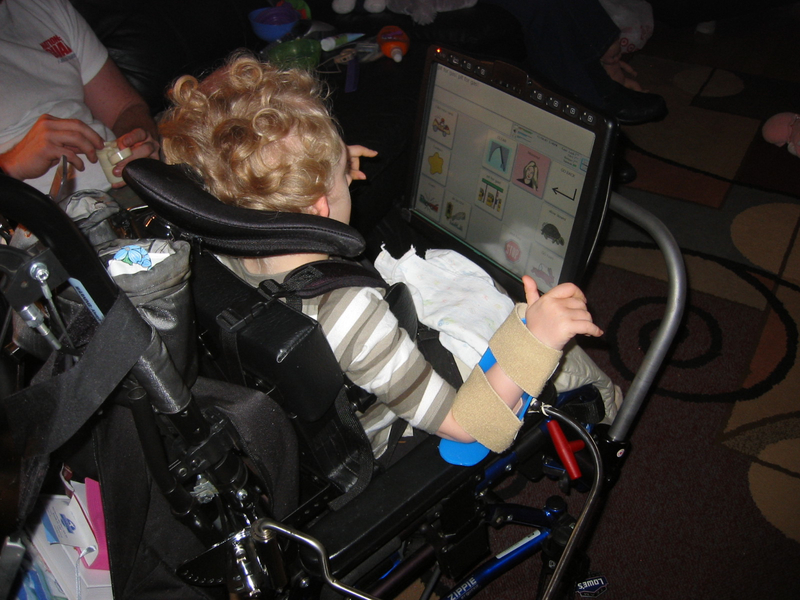 In the end, we selected a large screen (because of his motor issues, we thought he needed a larger target), possibility of eye-gaze selection, switch selection options, and one with a built in computer (to grow with him & allow him to watch movies or access the internet). The ones we debated on were a large Dynavox & an Eco. I liked the programming & the tech support of the Eco brand better so we decided to move forward with that. 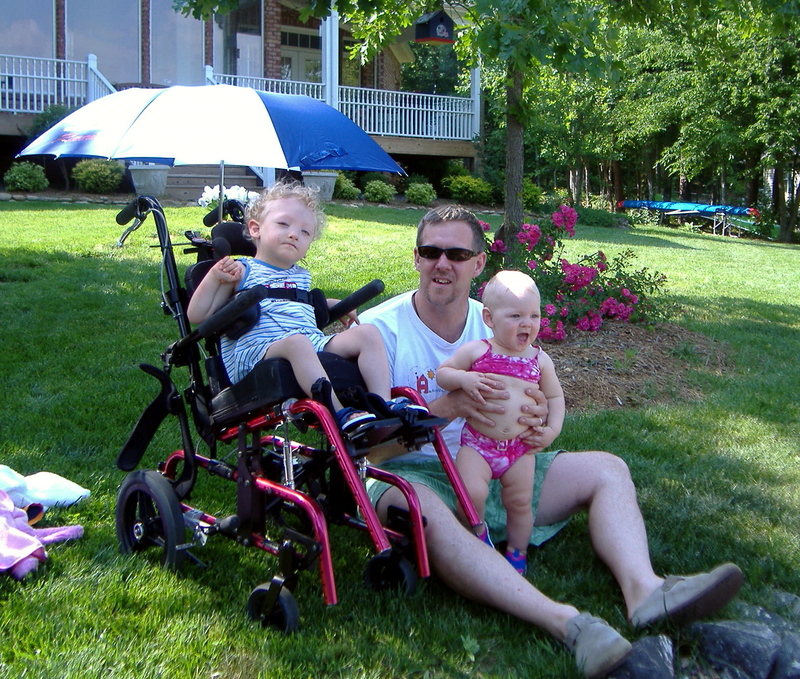 After a long involved process (I think it was almost 10 months from the initial evaluation to the day of delivery) challenges with insurance and assistive tech funding we finally got it in October 2007. Cayden’s screen was not full. We had a 15 icon screen, but several of the spots were empty to allow a bit of flex space in C’s reaching. The icons were about 2″x2″ which we had already determined was about as small as he could go visually & physically. This was an amazing device! It was so versatile & really was as programmable and as personal as we wanted it to be. I spent many long evenings putting in books, icon pages & school related pages. We had pages for food, for clothes, for people. Conversation pages. Pages for playing with his cars, his trains, his kitchen. Pages to have up while watching NASCAR or basketball with Dad. Pages of body parts & ailments. So many pages. But there were so many things to say! At first, the assistive tech teachers (who I loved) wanted him to really understand their list of 8 main ‘power words’ & wanted him locked on that screen. Stop. Go. Yes. No. Mom. Me. Out. Eat. That was it. They didn’t want him to do anything else until they felt he had mastered it. Front view using the arm supports. These were a crazy attempt to help him move his arms. I think you can see what he thought about them from the look on his face. They helped somewhat, but then he was bonking them on the device & causing mis-hits that way. They were hard to get him into and out of, & I hated having him so strapped into his chair, in case he started gagging, coughing or needed help. These were a good attempt but didn’t last very long. He would see new people at a doctors office & say “Hi. My name is Cayden. What’s yours? !” I wanted him to be able to check himself in at the doctor so I gave him and icon with our phone number. Trouble is, he saw a cute girl in the waiting room & said “Hi. My name is Cayden. What’s yours?! I live in North Carolina. My phone number is ……. ” He gave her our phone number! Seriously. The flirt! So I had to disable that screen! Beep, Beep, Get out of my way! Not long at all after we got the device, it was Halloween. He was so excited! He decided to be Lightning McQueen so I painted up a car for his chair. I programmed his Eco13 to have the standard Halloween phrases & a few Lightning McQueen ones. This year we not only got to hear “Trick-or-Treat!” & “Thank you!” at every house, but if we caught up to other kids on the sidewalk he’d say “Beep! Beep! 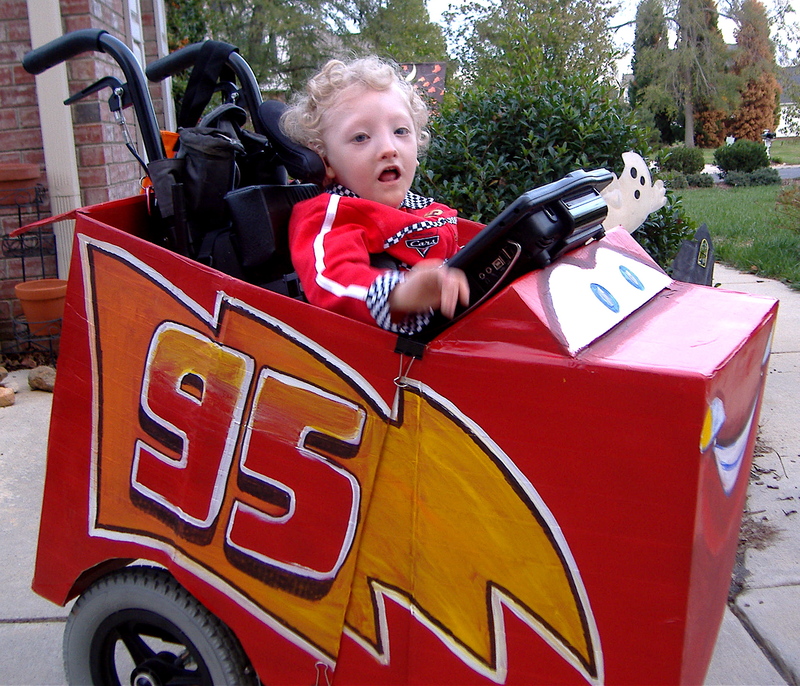 Get out of my way!” Then he’d add “I’m Lightning McQueen & I’m faster than fast. Vroom vroom!” He loved the Lightning McQueen phrases, but Beep! Beep! was definitely his favorite. The funny thing to me is that the device was so enticing to him (just like the iPad is to most kids) that he quickly overcame his arm movement challenges to make this work for him. His fine motor skills just bloomed with this device. All our prior attempts to assist him with step switching so he didn’t have to move his arms so much, and multiple switches everywhere to make selections went away. He just reached out and touched it. That was how strong the desire to speak was for him. A desire to be heard is typical. We all have needs & wants and thoughts that we want to share with others. Biblically, we often see people who wanted something, take their requests to Jesus, many of whom wanted to have their family and friends healed. Mark 7:32-37 (NIV) shares a one such story. There some people brought to him a man who was deaf and could hardly talk, and they begged Jesus to place his hand on him. After he took him aside, away from the crowd, Jesus put his fingers into the man’s ears. Then he spit and touched the man’s tongue. He looked up to heaven and with a deep sigh said to him,“Ephphatha!” (which means “Be opened!”). At this, the man’s ears were opened, his tongue was loosened and he began to speak plainly. My biggest complaint about Cayden’s ECO-13 was that this new, top of the line model SGD did not have a child’s voice on it. All we had to choose from was a variety of men’s or women’s voices. There were no kid voice options. We could have had another child record all of Cayden’s speech & program that in if we had wanted, but that seemed like SO much work to me it was not feasible. So he would talk with a realistic sounding man’s voice, which was a little funny, coming from a 4 year old. But it was better than nothing & I do believe that now children’s voices are available on similar devices. You can see here we have 2 micro switches on each arm of his wheelchair. We used velcro cable ties to attach them, and later the terry hairbands worked even better on the arms. You can see all the wires feeding from the switches up his chair into the backpack to attach to his SuperTalker. That was cranked up very loud so he could clearly hear it, but he had to know which page was in the talker so he could communicate correctly. Lots to process and remember. As I shared in yesterday’s post, (Day 14) Cayden quickly progressed through the switches, and it became obvious to me that we needed a better system. The constant switching of the papers in the SuperTalker was tiresome & really didn’t happen when it needed to. Instead we ended up using the pages on their own as an eye-gaze choice selector system. We used these frequently for choosing toys, clothing or food. I would have a page with 4 options on it with icons for different toys (or shirts or lunch foods). I would hold it up to him & he would look at the page, then select one with his eyes & smile. I learned to easily see which one he was choosing by where he was looking. If none of the choices were acceptable to Sir Cayden, then he would look away without smiling & a “Seriously, these are my only choices?” look on his face. 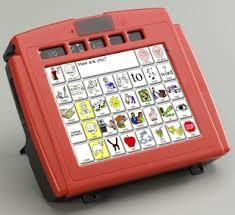 This is the Super Talker, we usually used the 4 choice page for hands-on, and 8 icon page for eye gaze. We learned that this system worked for any number of things & instead of using pre-printed pages, I moved on to small individually laminated icon cards (about 2”x2”). These were stored in a binder in business card holder sheets. This way, I could position them on his tray in any combination, & separate them enough to see his eye gaze selection easily. It worked wonders. We used this method with his hearing impaired specialists to start to test his comprehension and vocabulary. He went from being able to select from 3 items, with one descriptor, to five items with 3 descriptors in just a few months, once we learned his selection method. Imagine a table with 3 differently colored balls. We would say, “Cayden, show me the blue ball.” He would look at each of the balls in turn, and then… wait for it… wait… look and hold his gaze on the one he was choosing, usually with a smile, meaning “Yes, that’s it.” Then we would do it again, this time saying, “Show me the red ball,” or “Show me the big ball.” (in auditory training they suggest you not use the W question words, because children can become confused by the question words, and forget the real question. So you would always phrase the question in a command. (Show, point, pick, choose, grab, move). As he progressed we would then have 5 balls, of different sizes, textures & colors. So we would say “Show me the big blue ball.” or “Show me the small, bumpy red ball.” You could say Touch the green ball,” or “Grab the fuzzy ball,” but these involved motor skills that were too complicated for C to do when working on this task. He COULD do it, but then the wait time for him to find the fright one, then force his brain to make his arm move to grab the ball, WOW! Waiting for the answer was so long he would sometimes forget the question & so would we! I won’t forget the day when he did 3 descriptors with 5 objects. It was a collection of yellow vehicles. (all yellow). Dump trucks, crane, car, truck, bus. Some had things on them. So we would say, “Show me the dump truck with the blue duck. “ Usually you do this trying to trick the child, so we had a dump truck with a yellow duck as well. And a pick up truck with a blue duck. He selected easily. Then we upped the ante. After re-arranging the cars & animals we said, “Push the dump truck with the big yellow duck.” & he did. “Pull the dump truck with the small green duck” & he did. “Dump the duck in the little yellow truck,” & he did. He had mastered this skill. We couldn’t trick him! AND he was so motivated that he even moved his hands to make selections. Oh what a day! Cayden understood this skill & it showed that he had really mastered hearing the differences between duck and truck, push and pull and dump. He could do it with objects & he could do it with pictures as well. This was a BIG accomplishment for Cayden, as a hearing impaired child, as a visual impaired child, and as a child with holoprosencephaly. I have two funny stories to share. It was summer so we had a summer school hearing impaired teacher coming to work with Cayden who was not his usual teacher. She didn’t know him very well, but was working hard to keep him moving forward on his skills. We began working on the selection game. We were working on position words (under/over/on/in/between, etc). The teacher had brought a set of small plastic dolls & furniture to work with, which seemed fine and useful for the task. But Cayden did NOT want to participate. We tried him in a different room. We tried him in a different chair. No go. Wasn’t going to play. Finally, I said, “I think he doesn’t want to work with these because they are DOLLS & he is a BOY and he wants to play with cars or balls or dinosaurs.” As soon as we got his ball bin out, he did his assignment without a mistake. What a stubborn & smart BOY! The other major memory I have of him ‘showing his smarts,’ was when we were reading a new book called “Red Light, Green Light,” by Marjorie Wise Brown. It is a lovely book about animals, people & vehicles & where these things ‘live’ at night. The car goes in the garage. The cat sleeps in the tree. The mouse sleeps in the hole. There were at least 12 items that we read about, first they come out of their home, drive around, hit the red light ‘Stop!’ & the green light ‘Go!” & go home at night. So after one reading, I showed him some matching cards I had made. He had to pick the pairs for the things, matching the item to the home. After one reading, he correctly placed all the items in their home. This was huge to me & really gave me hope on his long-term progress. He got it. He was definitely NOT a vegetable, & by this point I really believed he was not even somewhat learning impaired. He was hitting his achievement goals, passing all expectations. We started to tease about needing to start saving for college for him, he was so smart. I really had high hopes for his future! Don’t give up on your kids. If my deaf, blind, mute, lame, brain challenged son could do this… yours can too. All kids have potential, you just have to keep searching to find their gifts, find their communication method, find their passion. Even the most challenged kids have a reason for living & a passion that ignites their curiosity. Cayden’s was cars, dinosaurs & trains, NOT dolls & furniture. It wasn’t that he couldn’t do the task, he just flat out didn’t want to with those particular items. Find their interests. Even if it means reading books about legos every night for a year, read them. Buy the legos. Buy the toys. Watch the movies. Find ways to learn that ties into that interest. Find the entry way into their brain by finding the entry to their heart and interests. No matter how hard we worked or all the progress Cayden made, college was not meant to be. Turning 5 was not even meant to be. We humans keep brainstorming options and plans, but God’s purpose prevails. (Proverbs 19: 21 MSG) I had Cayden figured out. I had options & big plans, but they were not part of God’s plan for Cayden’s life, or for mine. I was meant to be a mom without this child, and he was meant to spend a little while waiting for us in Heaven. I can’t wait until I get to see him & his great smile again! 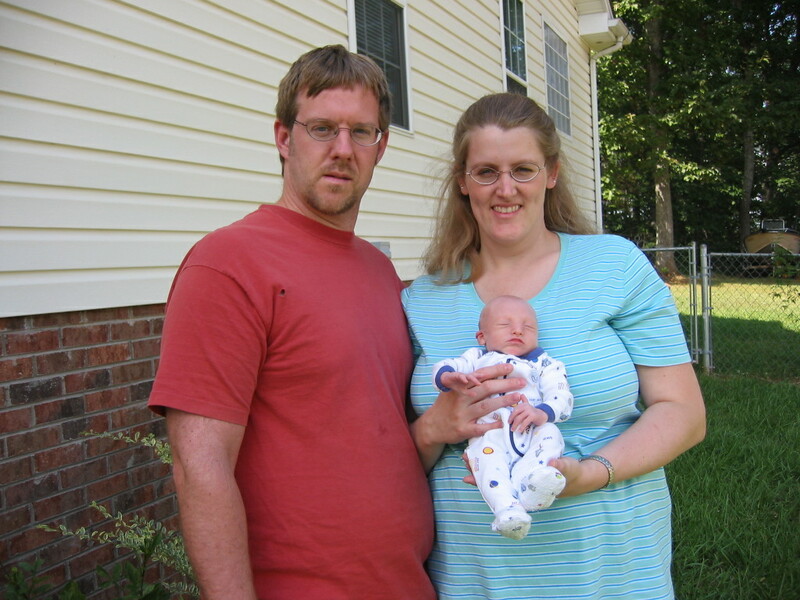 So… were YOU able to care for Cayden? I hope so! Today I will tell you more about his early communication methods besides the obvious vocalizations and whining, so maybe you will feel more prepared to watch him for us! We went through a series of more and more complex switches with Cayden, trying to see if he would be able to learn cause & effect. The first ones were basic baby toys that play music or light up when a button is pushed. This is a very simple learning step for most children, but for kids with processing and motor challenges this step can take quite some time to learn. Simple switch toys are all over the baby department, we particularly liked the v-tech ones (they had the best lights & sound combos). Cayden loving his vibrating Big Bird & large panel switch. Once he realized that his actions could affect his world in a pleasurable way, we were starting to communicate! 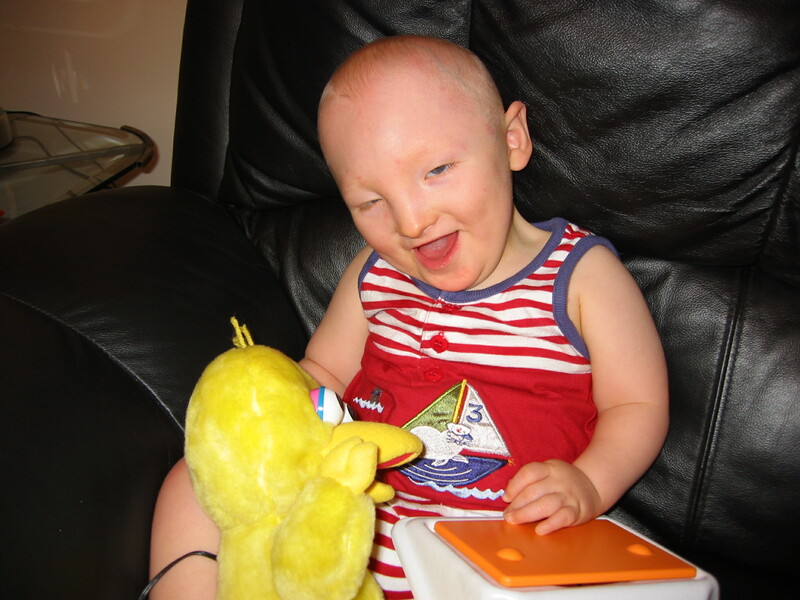 His first real assistive tech ‘switch’ was a vibrating Big Bird. He learned to push a button & the toy would vibrate. This of course led to the Tickle Me Elmo which was a favorite of Cayden’s for years. We also found that he worked really well with a switch called a toggle or swipe switch. It was more of a joystick style switch that he just had to push in any direction to make the object respond. As long as the switch was not at center, the toy would work. If he stopped pushing, the toy would stop. This was great for trains & other fun toys. Next he progressed to a switch talker. This one was a very basic communication device that had the ability to have switched out sheets with pictures on them, from 1-8 pictures per page (sizes went down as numbers went up). Each size could have several pre-programmed pages so we could talk about a variety of things, just by turing a switch on the side. This one was a good starter communicator, but it required a lot of adult participation, changing the sheets frequently (which took a lot of time to create). We ended up using it for a while as a talker with connected switches on each arm of his wheelchair, and the talker in the backpack. One hand would say yes, the other no. OR one would say please, the other thank you. His Halloween get up. 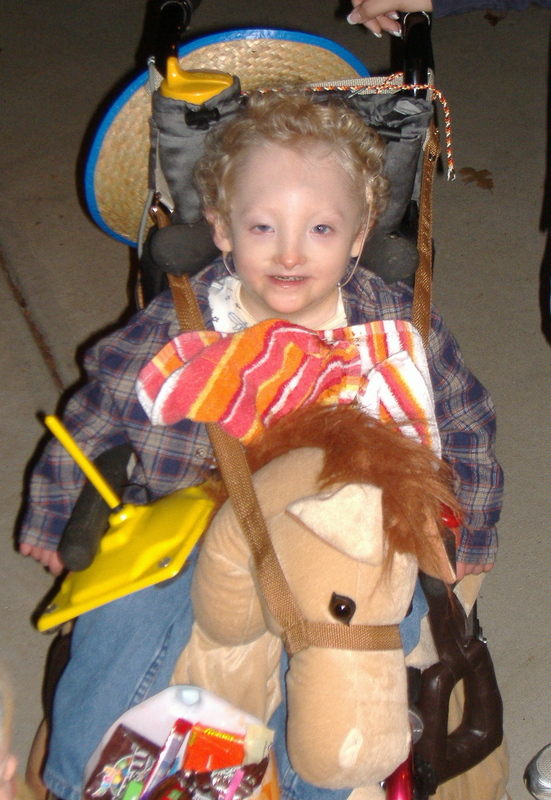 The toggle switch said “Thank you!” the little red switch (behind the horse’s ear) said “Trick or Treat!” Both were connected to the speech generating device in the backpack of his chair. MY favorite use of this setup was for Halloween. We used one to say “Trick or Treat!” the other to say “Thank you!” Cayden really got into this! The whole time we were going from house to house he would be pushing the “Trick or treat! Trick or treat! Trick or treat!” & we still had to remind him to say “Thank you!” every time. Just like a 3 year old! We were very blessed early on, to have the Sunday School class from our church donate some money towards Cayden’s fund. That helped us be able to purchase and try a variety of switches to see which might work the best for him long term. We found he could use anything down to a small quarter sized switch, and actually the smaller switches worked better for him, because they required less effort. Placing them on the arms of his wheelchairs really worked extremely well for him, and reused that setup for qute some time. We tried head tilt switches, (he was not a fan), squeeze switches (again, not great as he did not have good hand grasp), large panel switches, ok, but required a great deal of concentration to reach & raise his arm to press the switch. His favorites were the toggle and the micros. We were also able to borrow a lot of switches through our local assistive technology warehouse and lending library, which helped determine which toys might be worth the money. Switch toys are crazy expensive, and like any toys, kids get bored with them. Some of his longest lasting toys were a light up airplane with spinning fan propeller we got at CVS & used a switch adaptor with; an adapted Chicken Dance Elmo & a vibrating Big Bird. Other were not so popular, like the jumping frog or walking pig. He did eventually learn to use a 2 switch remote controlled car, (using his talker) which really was his favorite. The roller switch talker. This one played a section of a recorded song or book each time he rolled the switch. So to hear the whole recording he had to keep rolling the switch. Simple switches are everywhere you look too, once you know what to look for. You don’t have to pay the big bucks to get your kids to learn this concept. Have your child see that pushing the elevator button makes the door open & bing. Pushing the accessible door buttons makes the doors swing wide. Pushing the garage door opener or the doorbell, the tv remote, the light switch. The blender buttons, the ice maker, the fan switch all are good ways to learn cause & effect. Yes, we had special (expensive) switches to access many of these things, but really it wasn’t necessary. 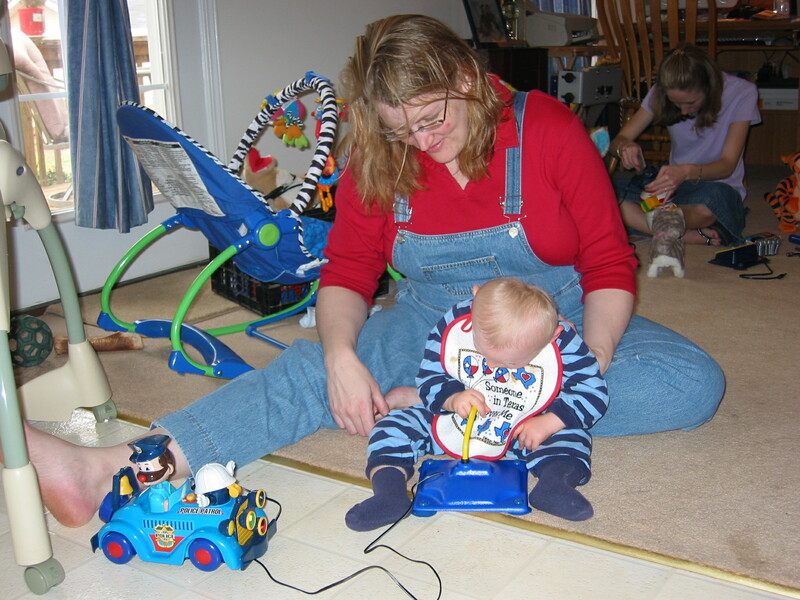 Why spend the money and take the time to train your non-verbal child to use switches? 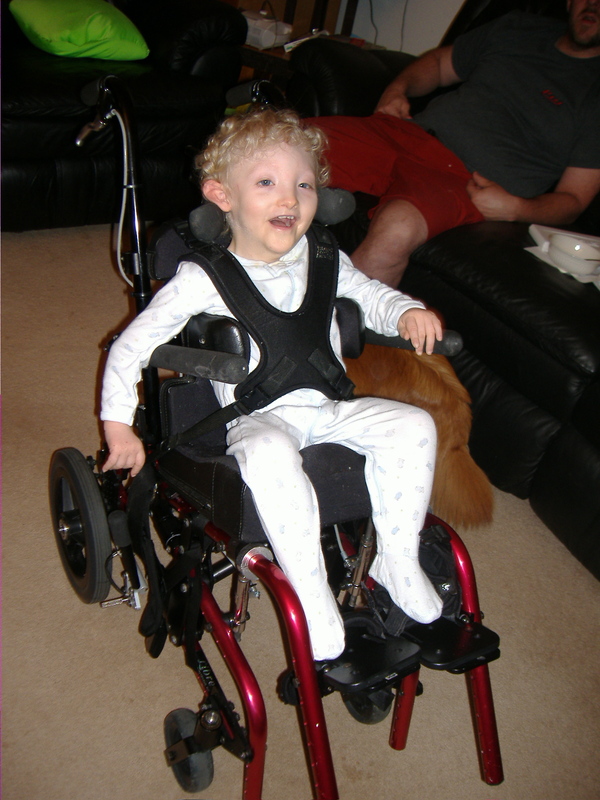 Well these simple steps were the first steps towards independence for Cayden. They helped him learn how to ask for things, and how to respond simply. 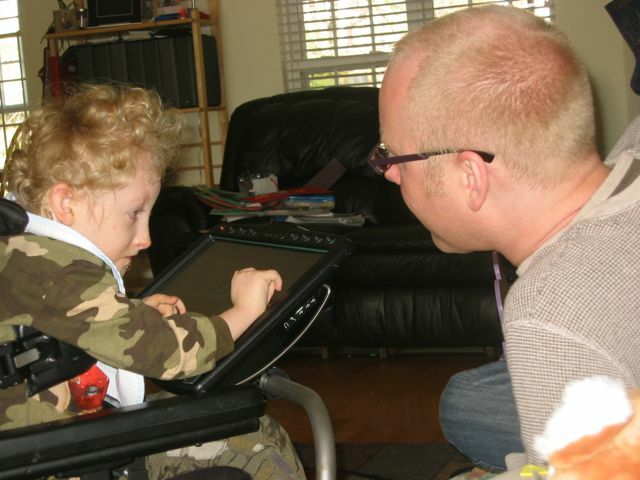 They taught him cause and effect which… fast forward to the future, helped him learn to drive a power wheelchair, and use a more complex assistive technology device. I will share more about that tomorrow, but know, the effort is worth it in the end. Watching Cayden do something as simple as Trick-or-Treating on his own, and seeing the smile it brought to his face, made the work worthwhile. Learning cause and effect also allows your child to start learning other things, like the consequences to actions, which in turn begins to allow discipline and training as taught in the Bible. Proverbs 29:17 tells us to “Discipline your children, and they will give you peace; they will bring you the delights you desire.” It is impossible to discipline a child or train a child in proper behavior if they do not understand the simple process whereby this action causes this result. 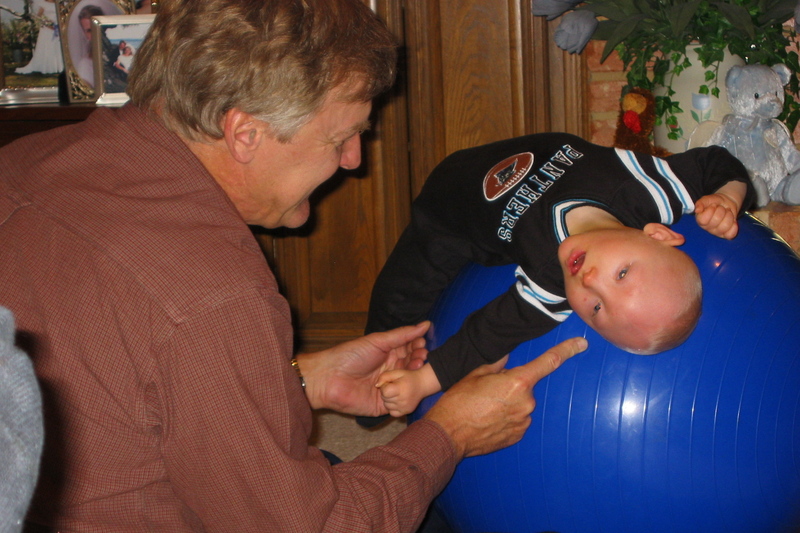 The discipline needed to train a child into a mature adult needs to begin early, and the fact that a child is disabled doesn’t mean that they don’t need discipline sometimes. Cayden needed to learn that he didn’t always get his way, that being naughty was not acceptable, and that his parents were in charge, just like all kids. Once we learned that Cayden could think just like any other child, he was not cut slack in our house on behavior. Whining was not encouraged (unless it was a communication tool), and tantrums were unacceptable. without the basic understanding of cause and effect, this training could not work, but for us it did. I encourage you to try it with your kids too!